Talley Beatty (1920-1995) was born in Shreveport, Louisiana and later moved to Chicago. He studied with Katherine Dunham as a child and was an original member of the Dunham Company for several years. He performed in the Broadway show Cabin in the Sky (1940), and in the films Carnival of Rhythm (1940) and Stormy Weather (1943) as a Dunham dancer, among others. He also performed in Showboat (1946) and Inside USA (1948). Beatty studied at the School of American Ballet and performed Blackface (1947) with Ballet Society, an early Balanchine company and was well trained in ballet technique. In the late 1940s and early 1950s he taught at the Dunham School. During that period he also started the first of several dance companies. 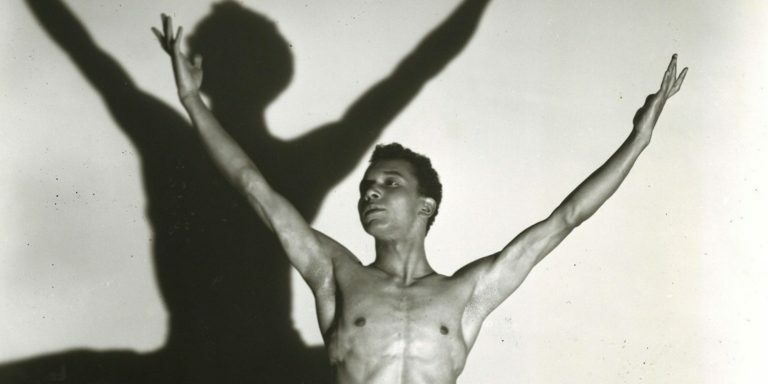 Beatty was one of the most notable African American choreographers. Among his many ballet are Road to Phoebe Snow (1959), Congo Tango Palace (1960), Caravanserai (1971), The Stack Up (1983), and Broadway shows, a revival of House of Flowers (1968) and Don’t Bother Me I Can’t Cope (1970) and Your Arms too Short to Box with God. “Obituaries-Talley Beatty” Dance Magazine, July 1995, 60.